Most social media feeds and blogs focus on the positive sides of our lives. While this makes reading a much more pleasant experience, it also distorts the image of reality. Some travel blogs make traveling seem like an endless joyride filled with rainbows. Maybe some people truly experience the world that way, but I personally don’t find it very realistic. My goal is not to make other people jealous of my travels – I enjoy inspiring others to travel more, but I also try to show a truthful image of the highs and lows of venturing. To show what the daily life of a globetrotter is like, I started taking notes of my travel days once a week. I chronicled my Mondays on the road for five weeks, and here are the results. 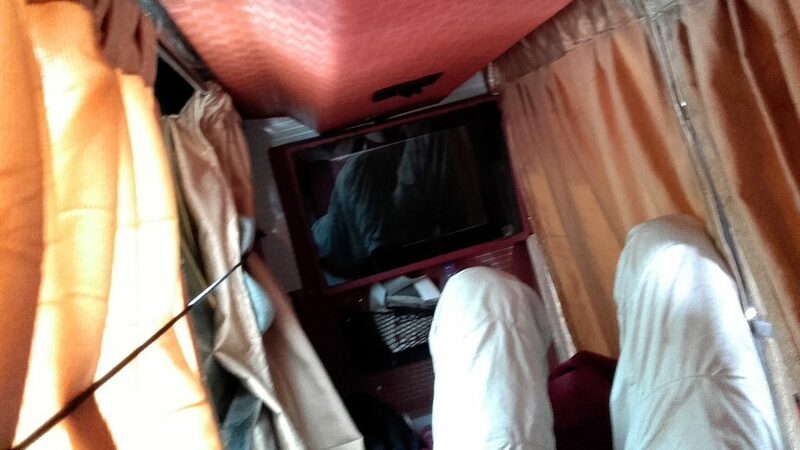 Waking up in a sleeper bus somewhere near Mumbai. A long transportation day without any big adventures. I didn’t sleep well on the night before and I was developing a flu, so I didn’t have any motivation for exploring. 5:30 AM: I wake up in a sleeper bus from Hampi to Mumbai. I was originally planning to leave Mumbay in the morning, but now I change my mind and decide to stay. I start looking for an accommodation from the Lonely Planet India guide. 6:30 AM: I drift back to sleep. 10 AM: I wake up again. The sleeper coach is somewhere in the outskirts of Mumbai even though the estimated time of arrival should have been at 7 am. 11 AM: I look around and realize the bus is almost completely empty. The only other passenger is the guy on a sleeper adjacent to me. Also, I notice that the bus is now driving away from the center of Mumbai. Darn. 11.45 AM: I’ve changed my mind again and decided to leave Mumbai. I leave the bus at the last stop, take a rickshaw to the closest train station and buy a ticket to another city a bit north. 12:40 PM: A train arrives half an hour late. The number of the train is wrong, but it’s going in the right direction, so I decide to hop in. During the train ride, I talk with a very nice Indian guy called Arjun who wants to be a rap artist. 3:30 PM: The train didn’t stop in the town where I was planning to go. Instead, I get out at the next station in a city called Surat. I ask a rickshaw driver to take me to any hotel and I get a room for two nights. I take a shower and feel like I’ll get a fever soon. 5 PM: I find a place to eat. I enter a closed restaurant but it takes a while before the workers dare to throw me out. Luckily, their fast food section at the entrance is open, so I order a burger. 6 PM: There’s no working Wi-Fi in the hotel, so I waste time and work on a novel manuscript. 7.30 PM: Dinner time. The place where I eat turns out to be extremely noisy. After dinner, I return to my room and read some more. 10 PM: I go to sleep and sleep for 11 hours. 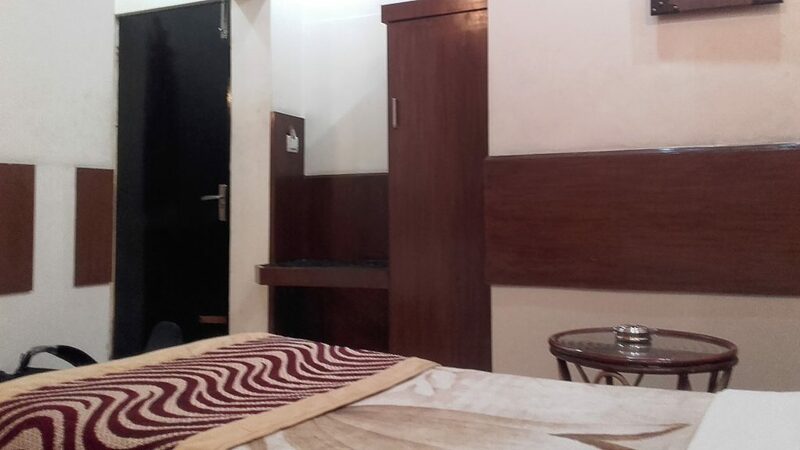 My comfy room in Zostel Delhi. A complete and intentional day off. My friend Tino was coming from Finland to India the following morning, so I decided to gather some energy before our adventures together. 6.30 AM: I wake up after a night of deep sleep. I think about getting up but decide to sleep some more instead. 10 AM: I wake up for the last time and play with my phone for a while. 11 AM: Breakfast. Afterwards, I trim my beard, have a shower and waste some more time on my laptop. 2 PM: Lunch at a nearby restaurant. After finishing my meal, I head back to my guesthouse to edit travel photos for the blog and surf the web. 5 PM: I’ve promised to see Tino at the airport early tomorrow morning, so I go for a walk to check the way to the airport metro. I put my laundry to washing machine and return to my room. 8 PM: By I’ve completely forgotten about the laundry, but I remember it now. I return to the washing machine and put the clothes on a clothesline to dry. Next: dinner. 10 PM: I do some Mindfulness exercises before my evening routines and read a little bit. I have to wake up at 4.30 am, but I don’t feel very tired yet. 11:30 PM: I finally try to get some sleep. 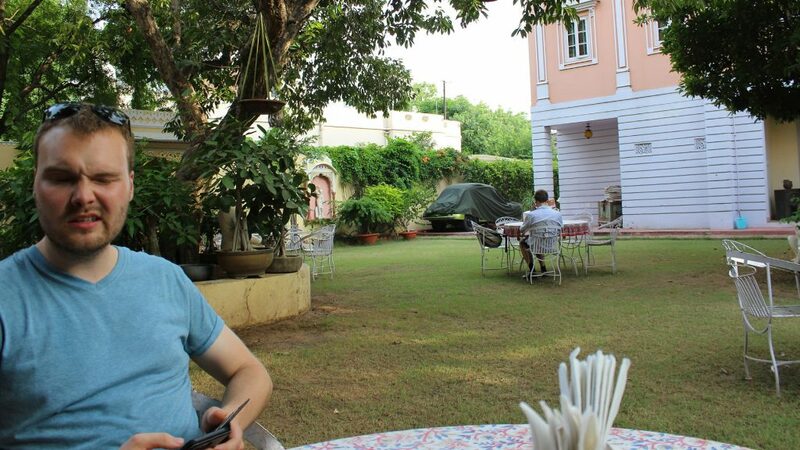 Waiting for a lunch with Tino in a garden restaurant in Jaipur. Once again, it was time for a day of transportation… and a day off. But this time, I was still traveling with my friend Tino, which made it different from the other mundane Mondays. 9.10 AM: I wake up before alarm. Shower, brushing teeth, packing and check-out. It’s the Independence Day of India, so we can see some school celebrations from our room window. 10 AM: Breakfast at the rooftop restaurant of our accommodation. 11 AM: We walk around the Pushkar Bazaar as Tino looks for postcards and homecoming gifts. There’s not much else left to do in Jaipur, so we decide to return to our guesthouse and leave the city. 12 AM: First, we take a bus from Pushkar to the nearby city of Ajmer. Then we switch to a bus to Jaipur. We have very good timing on the bus stations, as both our rides leave right after we come to the bus stations. 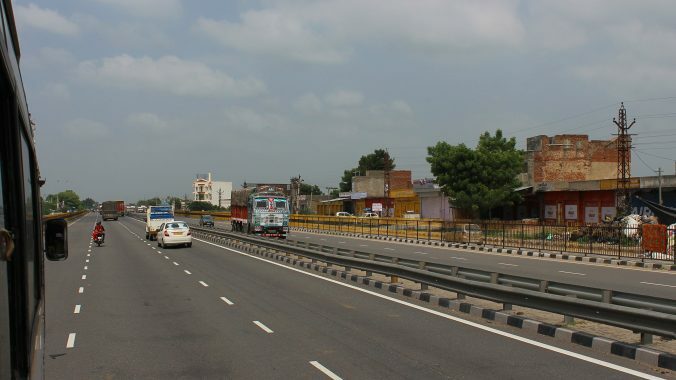 4 PM: We arrive in Jaipur and walk to our hotel for check-in. We meet plenty of all-too-friendly rickshaw drivers along the way. All of them want to make sure that we pick their rides when if we go somewhere later. 5 PM: We head out for lunch to a nearby restaurant. Yet another rickshaw drivers stops by and talks to us for ten minutes almost non-stop. We’re extremely hungry, so we’re very glad when he finally leaves. 6 PM: We return to our hotel after lunch. I work on a blog post and spend some time online. 9 PM: Time for dinner at the hotel. After eating, I read and surf the web again. 12 PM: I do some Mindfulness exercises and go to sleep. 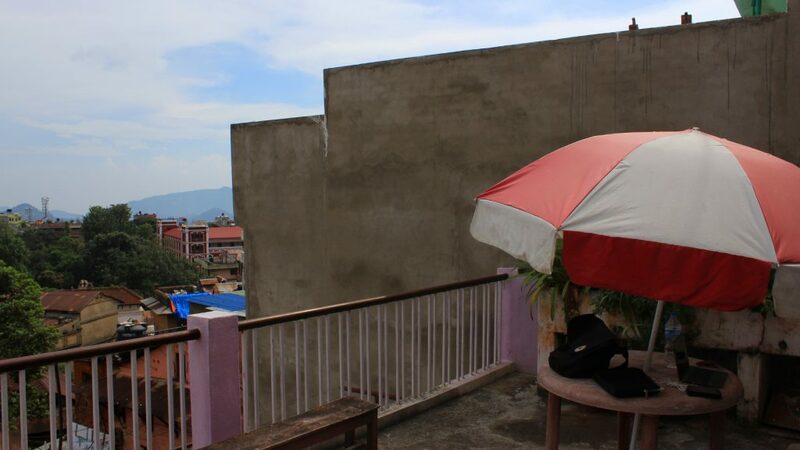 My roof top terrace in Tansen. There’s been plenty of “days off” on this list… and here’s another one! Either I rest a lot or I just happen to take days off on Mondays. The day before, I had hiked for eleven hours, so I decided to completely dedicate this day to the planning of my trip. 8.30 AM: I wake up, read and have a breakfast. 10 AM: I start planning (and overplanning) the itinerary of the end of the rest of the year. 2.30 PM: Wi-Fi is gone again, so I decide to pick and edit photos for a blog post about Lumbini. 4 PM: I continue researching different destinations and plan the following months. 8.30 PM: I return to my homestay, head up to my room and witness an incredibly beautiful lighting storm above the nearby valley. I take out my camera, and spend over half an hour taking pictures from the rooftop. 10 PM: I edit photos of the thunderstorm and try to publish one of them in Instagram when a power cut hits and takes out the Wi-Fi. I read some more and go to sleep. 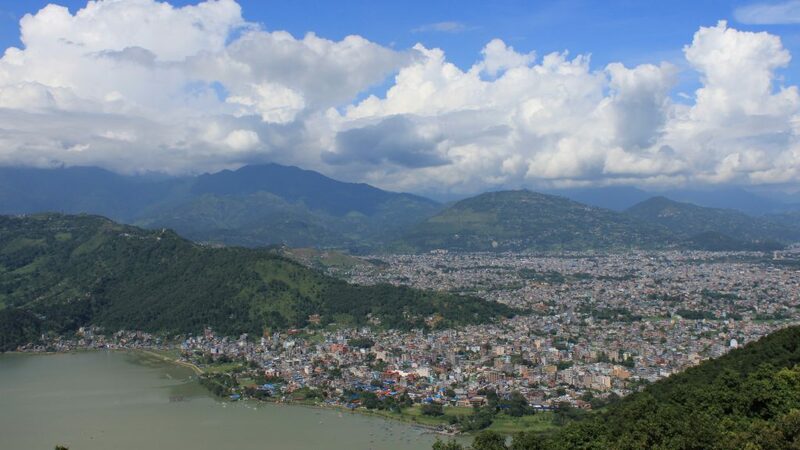 A view down on Pokhara from the World Peace Pagoda. And now for something completely different. After almost four months of rather quick traveling, I’ve settled down in Pokhara for three weeks. Instead of endless free time, my days are filled with studies of Nepali language. 8 AM: Wake up and breakfast. 9 AM: The first lesson of the day begins. 10.30 AM: The lesson ends. I plan to study some more, but my habit of procrastination takes over. Thus, I end up making a random video for Instagram and Facebook. 11.30 AM: I finally start recapping the lesson. 1 PM: Lunch. Besides all the studying, I’ve also promised to write a book review to the Finnish university student magazine Jylkkäri. Therefore, I spend most of the quiet moments of the day reading the book I’m reviewing. 2 PM: I take a boat ride across the local Phewa Lake to visit the World Peace Pagoda of Pokhara on top of a nearby hill. 3 PM: I reach the World Peace Pagoda. The walk up is supposed to take 45 minutes, but somehow I’ve managed to do it half an hour. I walk around the pagoda and take a few pictures in the extreme heat before heading back down. 4.30 PM: I get back to my guesthouse and continue reading the book. 5.30 PM: Time for a snack before my evening lesson. I take my notebooks with me to the restaurant and study while waiting for the food. 6 PM: The 90 minute evening lesson begins. 8 PM: Dinner. Afterwards, I end up procrastinating again when I should be doing my homework. 10.30 PM: I finally start doing my homework. 11:30 PM: Tomorrow’s another school day, so I stop studying and go to sleep.